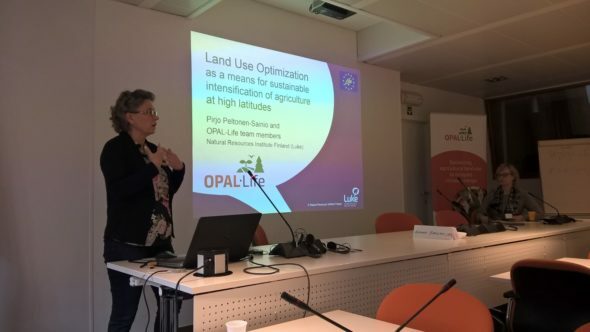 OPAL-Life project organized a seminar on climate smart farming on Friday April 13 at Copa-Cogeca premises in Brussels. The seminar shared ideas produced in the and reflections on land use optimization, climate change mitigation and adaptation. These ideas were discussed with scientists, WWF, DG-AGRI, EIP-AGRI, COPA-COGECA and farmers. A warm thank you for all participants! Below you can find the presentations and a brief summary of the discussion. Professor Peltonen-Sainio presented the basic principles of sustainable intensification and land use optimization. She also presented how climate change already affects agricultural production in Finland. 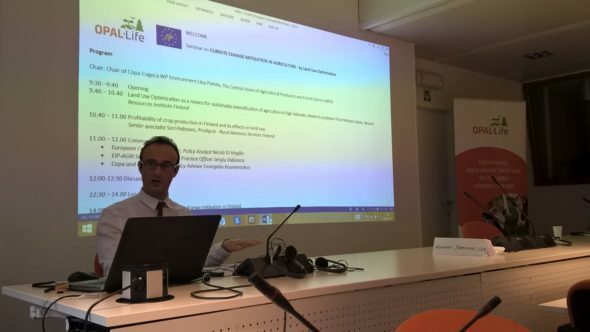 The project has developed a tool for land use optimization called ”PeltoOptimi” (land optim) and Peltonen-Sainio presented the rationale behind the tool. PeltoOptimi tool is currently being tested with pilot farmers. The tool helps the farmers to locate those field parcels where it is rational to intensify production and, on the other hand, those where extensification or afforestation action is more profitable in their current state. The tool will be openly available in the internet to Finnish farmers soon. 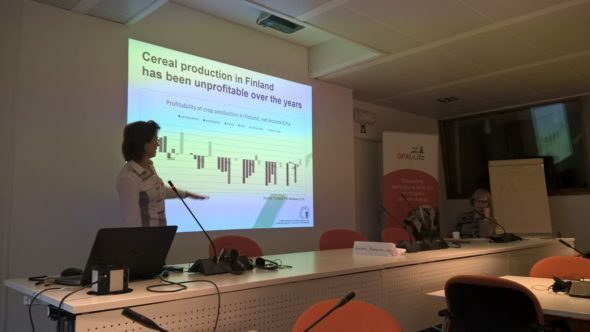 Peltonen presented the economic profitability of agricultural production in Finland. She also discussed how profitability influences land use. The production costs of grain cultivation have been higher than the returns (prize of yield and subsidies) from 2014 onward. This will easily lead to a negative spin when reduction of income leads to fewer investments, which will lead to even more reductions in income. Diversifying crop rotation and optimizing the use of land would somewhat ease the situation. In the commentaries, the environmental aspects were highlighted as heavily influencing politics. Farmers were encouraged to better take this into consideration and think of it as a possibility. Farmers’ opinions on land use optimization tool and its use were discussed together with the co-creation of the tool with the environmental NGO’s. The commentators stressed that land use optimization is a big challenge and the usage of the optimization tool outside of Finland was discussed. The panel discussed about enhancing the economic situation of the farmers while also adapting to and mitigating climate change. In Finland, the farmers acknowledge their responsibility as regards to climate change. It should however be kept in mind that the first duty of farmers is to produce food and feed and this should be profitable. The role of consumers was discussed also. 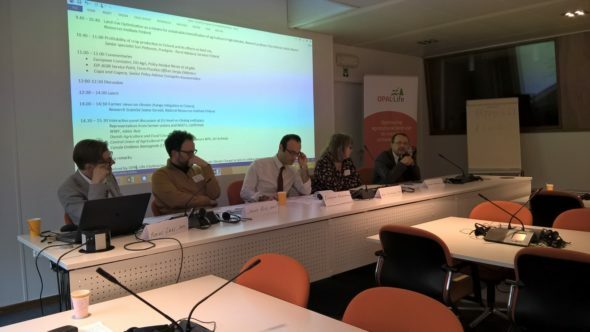 The panelists agreed, that the role of the consumers in agricultural transition is big and the farmers will respond to consumer demand, when it is large enough. Maybe sharing information to consumers and change in behavior are the crucial elements on climate change mitigation, the panel concluded.